Assignment Why did the Soviet Union support Egypt in 1956 during the Suez Canal crisis? Background At the same time as the Hungarian uprising, a serious crisis developed over control of the Suez Canal, which connects the Mediterranean Sea with the Gulf of Suez and the Red Sea. Built between 1859 and 1869 by the French engineer Ferdinand de Lesseps, it was acquired largely by Great Britain in 1875. By the provisions of the Anglo-Egyptian Treaty of 1936, Great Britain enjoyed the right to maintain defense forces in the Suez Canal Zone. Egyptian nationalists repeatedly demanded that Great Britain evacuate the Canal Zone, and in 1954 the two countries signed an agreement, superseding the 1936 treaty that provided for withdrawal of all British troops, and in 1956 all British troops left. When Egypt concluded an arms deal with Czechoslovakia, the U.S. Secretary of State John Dulles announced the withdrawal of all U.S. funds and assistance for President Gamal Abdel Nasser's, who had come to power in the 1953 nationalistic revolution, development program. In response to this treatment by the United States and the refusal of Western powers to fund the Aswan Dam on the Upper Nile River, Nasser nationalized the Suez Canal on 26 July 1956. The nationalization of the canal surprised the world, especially the British and French stockholders who owned the Suez Canal Company. Although Nasser promised compensation to the company for its loss, Britain, France and Israel began plotting to take back the canal and overthrow Nasser as well. When attempts to reach an agreement with Egypt on a new form of international control for the Canal failed, Israel accused Egypt of planning an attack and sent the Israeli army across the Sinai Peninsula toward the Canal. (Britain, France and Israel had united in secret, something that they denied publicly for many years, and made arrangements for Israel to make the initial invasion of Egypt and capture one side of the Suez Canal.) When further British and French diplomatic initiatives failed, they sent troops to occupy the canal. The United States opposed this action as a violation of the principle of self-determination. The American delegation at the United Nations voted in favor of a General Assembly resolution calling for an immediate ceasefire and the withdrawal of the invading troops. Great Britain, France and Israel eventually accepted these terms. In March 1957, under the supervision of a U.N. police force, the Suez Canal was cleared of wreckage and opened to shipping. 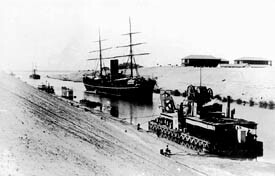 The canal was returned to Egypt, and reparations were paid by Egypt under the supervision of the World Bank. Overall the actions of Britain and France served to draw Nasser and Egypt into further relations with the USSR. The fight over the canal also laid the groundwork for the Six Day War in 1967 due to a lack of a peace settlement following the 1956 war. In January 1957, President Eisenhower asked Congress for authorization to use military force, if requested, by any Middle Eastern nation to check aggression and, second, to set aside a sum of $200 million to help those Middle Eastern countries that desired aid from the United States. Congress granted both requests. This policy became known as the Eisenhower Doctrine. 16 November 1950, Egypt demanded that British leave the Suez Canal zone. 23 June 1956, Nasser elected president of Egypt without opposition. 19 July 1956, Britain and US refused to provide financing for the Aswan dam project. 26 July 1956, Nasser nationalized the Suez Canal Company. 28 July 1956, Britain froze Egyptian assets in London. 1 August 1956, US, Britain and France hold talks about the Suez Canal. 29 October 1956, Israeli forces crossed the Egyptian frontier and drove toward canal. 30 October 1956, Anglo-French ultimatum issued to Egypt and Israel asking that both withdraw ten miles from the canal zone. The ultimatum also asked Egypt to allow a "temporary" occupation of the zone, which Egypt rejected. 31 October 1956, Anglo-French forces attacked Egypt in the Canal zone. Israeli occupied the Gaza Strip and key points on the Sinai Peninsula. 5 November 1956, British and French captured Port Fuad and Port Said. 6 November 1956, cease fire forced by U.S. pressure. 8 November 1956, hostilities ended. 21 November 1956, first UN peacekeepers arrived in the zone. 22 December 1956, the last Anglo-French forces left the canal. 1 March 1957, Israel agreed to withdraw from the Gaza Strip and Sinai. There are short biographies available of some of the principles involved in the 1956 Suez crisis: Khrushchev, Eisenhower , Eden and Nasser. There is a short essay online that discussed many of the key players and factors. History of the Suez Canal is another short article about Disraeli's purchase of the shares to the canal, as is a paper and another short essay. U.N. Peacekeeping forces made their debut as a result of the Suez crisis (see also www.un.org/en/peacekeeping/missions/past/unefi.htm). After Egypt nationalized the Suez Canal, President Eisenhower refused to join Britain, France and Israel in an invasion of Egypt. He later addressed the nation about the Mideast crisis on 20 February 1957. Recommended Books A concise reading list might include: W. Scott Lucas, Divided We Stand: Britain, the US. and the Suez Crisis (1995); Keith Kyle, Suez (1991); William Louis and Roger Owen, eds., Suez 1956: The Crisis and Its Consequences (1989); and Anthony Eden, The Suez Crisis of 1956 (1960).